The food scandal in China is already becoming a distant memory to the restaurant operator. A second food scandal in China in as many years has proved to be only a speed bump in Yum! Brands' journey higher. It's hard for investors not to be pleased with how well Yum! 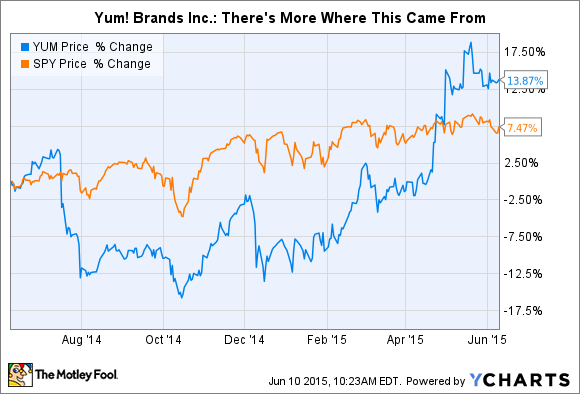 Brands (NYSE:YUM) has performed in the face of adversity. Despite Yum! tainting the well of goodwill in China with its second food-quality scandal in as many years, investors have held out hope the restaurant operator's biggest market will forgive it once again. They have bid Yum! Brands' stock 40% higher since its low point last October following the report that one of its Chinese suppliers had used meat that was well past its expiration date. The stock is up about 15% over the past year. Although anything can happen to upset the recovery, here are three good reasons why Yum! Brands stock might not be done rising. 1. China recovers faster than expected. Even with the scandal, China accounted for almost half of Yum! Brands' total first-quarter revenue and more than a third of its operating profit. It's essential Yum! gets back on track in the region, because it still has the most potential for future growth, which means the restaurant operator can't risk not being a part of it. Just like the last time Yum! Brands' suppliers were implicated in a food scandal, the chain took its lumps and immediately vowed to get on the road to recovery. China comparable-stores sales were down 12% in the first quarter on a 6% decline in sales, but that was actually better than many expected and an improvement over the fourth quarter's 16% plunge in China comps on an 11% drop in system sales. And it doesn't seem as though Yum! had to resort to gimmicks like it did the last time, such as giving away a bucket of chicken at its KFC restaurant to lure people back. Yum! Brands seems content to wait this one out, albeit after dropping the suppliers and tightening up its oversight. Sales might yet accelerate, as happened last time, and that would drive the division forward faster. Yum! has 6,846 restaurants in China and 41,691 restaurants overall. 2. Pizza Hut contributes instead of dragging performance down. Here at home, both the KFC and Taco Bell chains are turning in strong operational performances. Pizza Hut, on the other hand, remains an anchor with comp sales going flat and operating profit falling 2% in the first quarter. For all of 2014, the pizza chain suffered a 1% decline in same-store sales, with restaurant margins contracting 3.5 percentage points to 8.2% and operating profit tumbling 13%. If Yum! Brands could get Pizza Hut to settle in, let alone perform more like the company's other two chains, it could benefit the bottom line. But like McDonald's(NYSE:MCD), which believes it needs to become more like rival fast-casual chains to get out of its funk, Pizza Hut has tried upgrading its restaurants and offering lots of pizza combination options to jazz up sales. Unfortunately, results have been about as successful as those at the burger joint. That's why Yum! Brands is turning to the market analysis firm Collider Labs, which it recently bought. It credits the analytics firm with Taco Bell's current success; with the analytics team now in-house, dealing with Pizza Hut will be the first order of business. 3. Breakfast becomes even more important. Who would've thought a Waffle Taco and an A.M. Crunchwrap could steal market share from McDonald's, the reigning champ of the breakfast daypart. But Taco Bell did just that with an exceptionally strong first-quarter effort, reporting that system sales widened 9% on the strength of a 6% increase in comps and 3% unit growth. As a result, restaurant margins expanded to nearly 20%. With management hinting that more innovative products like the Crunchwraps and waffles are in the pipeline; pricing tailwinds in commodities such as beef and cheese; and the effects of the price hikes it made last year when commodities were spiking, Taco Bell could be a star performer again this year with breakfast the leading daypart. Taco Bell's breakfast menu made a strong showing against McDonald's in the daypart. Image: Taco Bell. As strong as Yum! Brands' first-quarter effort was, and the continued growth expected in the second, the restaurant really expects to shine in the back half of the year. If any or all of the above catalysts play out, investors should expect Yum! Brands stock to follow.